Clydebank rests on part of the remains of the ancient Roman Antonine Wall, which marked the northern-most boundary of the Roman Empire and has been classified as a World Heritage Site since 2008. The town started out as a relatively modest settlement before rapidly developing in the 19th Century to become a major UK shipbuilding centre. The rest of the town grew in conjunction with the expanding shipyard and by the late 1800s, new housing, churches and a school had been built to accommodate the influx of dockyard workers arriving into the town. Clydebank’s maritime history is well documented in the Clydebank Museum, but those who prefer a more unique and interactive experience can visit the Titan Crane. Built in 1907, the Titan Crane is now a quirky tourist attraction, which provides a fascinating insight into Clydebank’s shipbuilding heritage and treats visitors to some rather impressive views at the top. There is even an option for plucky souls to bungee jump from the top of Titan Crane at certain times of year. 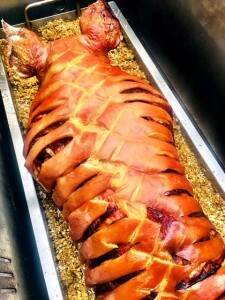 If you enjoy unique experiences, trying some of Hog Roast Clydebank’s slow-roasted pork is an absolute must. We have earned our reputation as Clydebank’s number one supplier of hog roasts due to the superior quality of our meat, our cutting-edge cooking equipment and our highly adaptable catering team who are capable of getting their sleeves rolled up and cooking absolutely anywhere. Being perfectionists, we aren’t just satisfied with giving you the best hog roasts in the area though- we can also provide catering packages that encompass all tastes and dietary requirements. Whether you prefer traditional flavour combinations or have more exotic tastes, Hog Roast Clydebank can provide a menu that will match your preferences exactly. We also think outside the box when it comes to the type of events we cater for. We are always an incredibly popular choice for wedding receptions, large outdoor events and corporate entertaining, but if you need catering for an event that is a bit out of the ordinary location or theme-wise, such as a buffet for a meeting of a local history group at the Clydebank Museum or dockyard dining to celebrate a special occasion, the Hog Roast Clydebank team will gladly do the honours.